Constable Executive Jobs. Candidates can get the application form from the official website of Delhi Police Information Center, Guwahati. Last date to submission of application form for this Delhi Police Constable Executive jobs is 30-10-2018. Candidates selection will be held based on physical efficiency tests, physical standards tests and written exam for this Delhi Police Constable Executive Jobs. For Ex Serviceman ESM 10% posts are reserved. More information about this Delhi Police Constable Executive recruitment age limits, application form and other details are mentioned below. 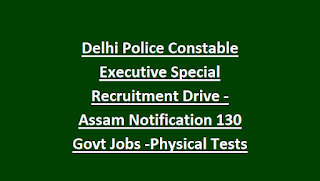 There are total 130 posts in this Delhi Police Constable Executive recruitment of Assam Police. 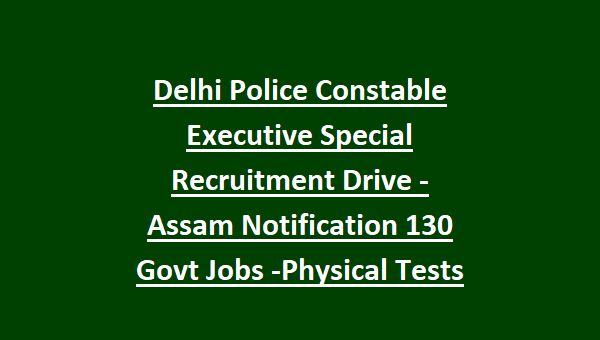 Assam state candidates only eligible for applying this Delhi Police Constable jobs. Post name and category wise vacancies are given below. Must have qualified 10+2 for applying these Constable jobs of Assam Police. Application fee is Rs.300/-. Candidates have to pay this to get the application either in DD format or by cash. DD to taken in favor of DCP/Recruitment Cell, New Police Lines, Delhi (Payable at Delhi). Candidates selection will be based on physical standards tests, physical efficiency tests and written exam for this Constable Executive jobs of Delhi Police. Written Test consists of 100 questions (Objective type) and exam duration is 90 minutes duration. Question paper will be given in English and Hindi Languages. Candidates who are interested in this Delhi Police Constable recruitment they can get the application from Assam state any district head quarters or from the HQ of Delhi Police. Or can download application form from Assam Police official website of www.assampolice.gov.in.